OK, I know the post title gives it away, but isn’t it so telling that we can instantly recognize the Frida theme. 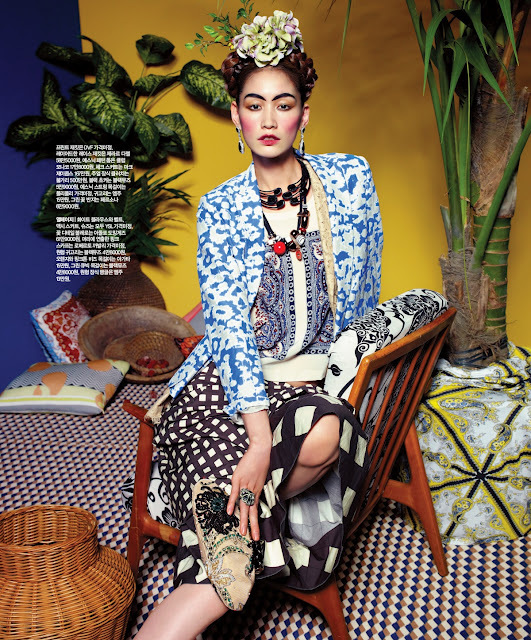 The intense color of the walls (yellow and especially blue), the lush plants in the background, the mix-and-match patterned dress, the flower hair ornament, and above all the piercing gaze and the emphasized brows (even if not really a unibrow) all lead the mind to Frida Kahlo. Over the last two decades she has achieved a real cult status. In fact, I can tell you when her birthday is – a few weeks ago – only because social media was inundated with “Happy Birthday, Frida” posts from friends. Even as a Frida fan myself, I am ambivalent about this popularity. Until only recently, say some 20 years ago, she was mostly known as Diego Rivera’s wife. I personally knew about her as a child in relation to Mexican muralism, which, for cultural and political reasons, was well known in Bulgaria, and along with muralism, the whole cultural milieu around it. And still, that was mostly because I was exposed to old art magazines. Not sure what drove this growing interest, so many decades after her death. Probably not a single event, but accumulation of new discoveries, previously undisclosed information and new revelations. Frida’s diary, for example, was first published in 1995 by Carlos Fuentes, a celebrated novelist and advocate for Mexican cultural heritage, which of course drew attention to her. What followed was a continuing wave of newly discovered photos, albums, wardrobe, etc, that fed the understandable interest in finding iconic women artists in the past who had not received attention in their time. And a kept secret over a long period of time, an unexpected discovery, always captures imaginations, as the Vivian Meier saga demonstrated. But sadly this interest has overflown into a popular culture deluge. Not only are museums stocking their shops with Frida paraphernalia like fridge magnets – I can understand that – but now there are Frida-inspired knock off clothes, Frida cookbooks and even Frida bathtub designs. (I won’t give you a link for those – they are easily findable through google.) So it is clear that she is now used as an exploitable brand for marketing purposes. Just like the magazine ad, page up. 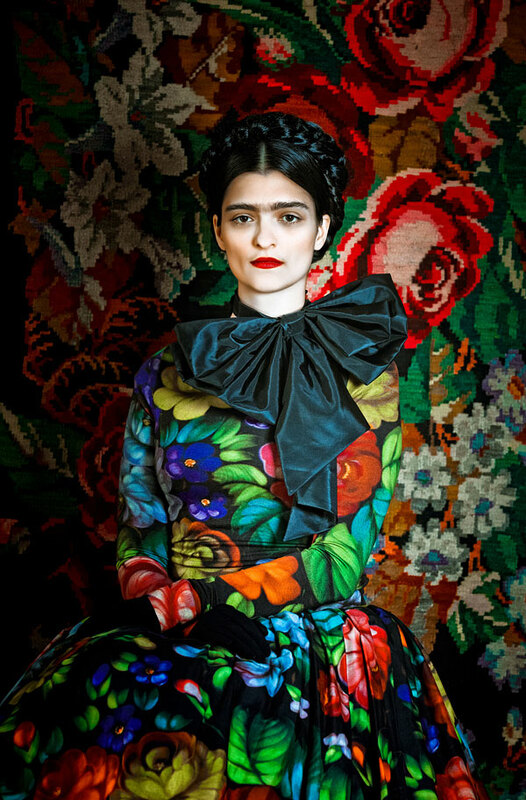 Frida is now a bona fide subject of art and especially photography. Sometimes that means reenacting famous paintings, but most of the time its reproducing motifs, mashuping her paintings and photos and reinterpreting her persona visually. Even a local art center, The Bath House Cultural Center in Dallas, organized an exhibition last year on this premise. This mania is what I am especially ambivalent about. Yes, it is great that an amazing artist like Frida will be recognized and emulated. But at this point, the trend makes her into a cult figure. And knowing something about cults of personality, I don’t see much positives in it. When you equate an artist with her life story, you risk superficiality. And by making her life story so popular, it has become an oversimplified, distorted parable with a lack of depth. Missing are the addiction, the political authoritarianism (and Stalinism) and other ideas to which she subscribed, betrayals of friends – not just love interests, but real betrayals – that make for a complex human figure. The idealization, almost sainthood, which popular culture attributes to her, like Che Guevara, not only depicts a shallow portrait but sets her up for denunciation and resentment when those unflattering details inevitably emerge. When this happens, her art popularity will suffer from the backlash as well, tightly as it is connected to her persona. There is another danger. When an artist becomes popular due to her life story, to the extent that she becomes a pop culture icon, there is an inevitable backlash from critics that undervalues her art – not only as a reaction of suspicion of popular taste, but her work is seen as an illustration of her life. Instead of seeing universal or even groundbreaking concerns in it, it is read as just a reflection of her autobiography. Her artmaking is in danger of being seen as just art therapy. In the case of Frida, symbolism is read solely in the key of her sexuality, infertility and – of course – relationship with Diego. As a comparison, this is a key that is never applied to Diego’s art. More disturbingly, though, it may be the case that this interpretation doesn’t necessarily reflects Frida’s reality. For example, she didn’t really long for motherhood in the way it is popularly believed. As artwork, though, the gravest mistake this emulation artwork makes is the sin of cultural appropriation. 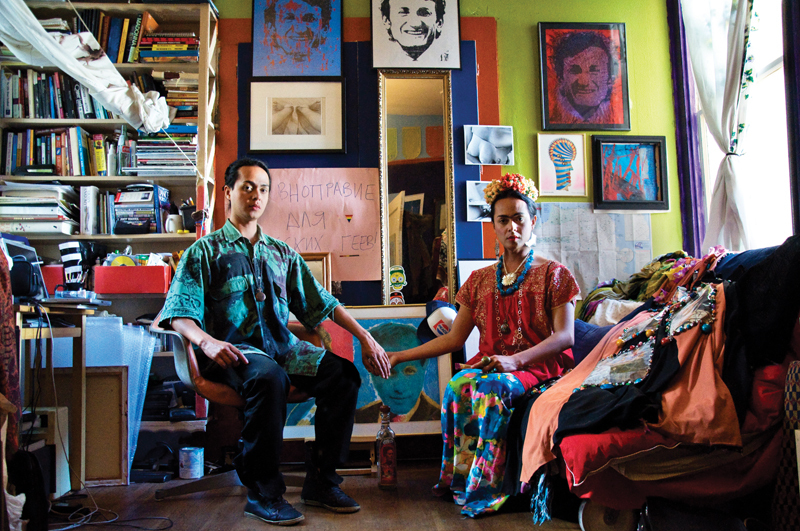 It is not just about Frida. It is a superficial and stereotypical pick-and-pluck mish-mash of Mexicanness that is recreated in front of our eyes, as the consumer of this emulation. I do believe that Frida should be celebrated and studied. But there are other ways besides copying her paintings or style in selfies or appropriating her favorite motifs. For example, by writing love letters. Embracing your own tragic circumstances – like Frida’s painting on her body cast. There must be something sad to paint on in your life, literally and figuratively. Writing a diary – with drawings. If you do selfies, making them probing and honest rather than flattering and self celebratory. Avoid flowers in your hair or a painted unibrow. Really study her portraiture approach instead of copying a few external elements. Or better yet, really learn about her art – from a reputable source. 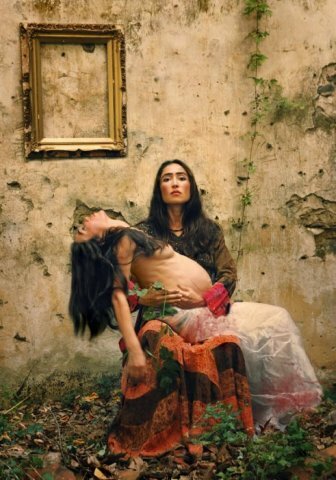 This entry was posted in photographers, photography, portrait, reflections and tagged Frida Kahlo. Bookmark the permalink.